In recovery we need to take responsibility for our own actions. When I was gripped in the claws of addiction, I blamed everyone else for the mess my life has become. When looking back, it must have been a defence mechanism, a way to rationalize my addiction. Thinking that I don’t have a problem, the problem was my surroundings, and the people in my life. This way of thinking had many bad consequences. The way I treated everyone with the utmost disrespect, still today brings tears to my eyes. The addicted mind, only thinks about the drug. It doesn’t think of consequences. It only thinks of the next 15 seconds, the next hit. Taking responsibility for ones actions, is a very important aspect in recovery. Excepting that, you, and you alone are responsible for the situation you find yourself in. And only you have the ability to make it better or worse. How do you expect things to change while you live in denial? Except responsibility. Take charge of your own life. No one else will. Decide today to be open an honest with yourself. See where you went wrong, and think of solutions to fix it. Don’t you think that a lot of things in the world would be different if people would start taking responsibility for their own actions? Instead of blaming our failings on others, take an introspective, and honest look at yourself. Taking responsibility, builds an honest, positive, humble attitude. It gives you different view on life. It shows you, your shortcomings, strengths, and weaknesses. In the long run it gives you the ability to make informed decisions, and good judgement. Taking Responsibility makes one an honest open individual. It helps to restore the trust that was lost. Honesty and trust is the two main cornerstones of and interpersonal relationship. People won’t look down on you anymore as a lying, and deceiving drug addict. They will look up at you in admiration, and they will start looking at you for guidance. It’s not going to be easy. To be honest I never felt more ashamed of myself, but it was the start of self-forgiveness, the start of knowing myself. It was the start of my healing process. Guess what, it is a much easier, fulfilled life living in the truth. If I was in the wrong I take responsibility, I apologise if I need to, and fix it if I can. People will stop questioning you, because they know that you speak the truth. Don’t hide behind anything in your life anymore, be open, be honest, and be wise enough to admit when you’re wrong. Never let your pride come between you, and a new fulfilled, and happy life. Take a stand. It was our decision to start living a life of lies. It is also our decision to start living a life of truth. Either one is our choice. 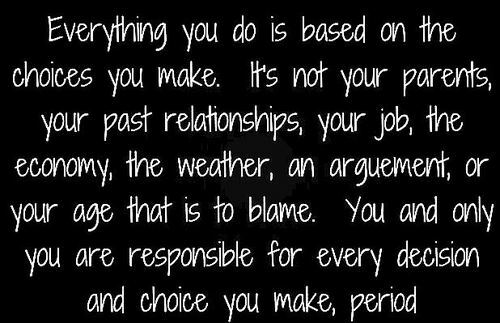 Remember to take responsibility for the choice you make. Congratulations, very good advice and I feel this is so true about living your life as a big lie, it is only up to the individual to recognize this, I have someone that I love that is and addict and she is living that life of lies and blaming everyone that truly loves her. I do pray for her and also don’t judge her past, nor do I let her present define her either, I can only encourage her future. Hi I am so sorry to hear that. Yes unfortunately she’s got to realise that she has a problem. The problem with this disease is, it doesn’t let think clearly. If possible you guys should organise an intervention, and if possible get her help a.s.a.p. Only when she is clean will she be able to think clearly. No one has to hit rock bottom before they get help. The sooner the cycle of addiction is broken the better. Thank you for your advice, I have started this blog to share about what I have experience with her. I truly love this young lady and do wish her nothing but the best, I’ve tried not to judge her and not let this addiction define her and really want to encourage her future. She is currently with one of her johns who is a trucker and is keeping her away from people that care. So all what I can do is pray that she see what is happening since she is clouded with the fact he is supplying her with drugs food and a truck to live out of! She was already lock up for sales put did not get the help she need then. I was visiting her while she was there and she was fine, just her x who was a addict, put now dead from a bad drug deal intervene her as she was release an got her right back on the drugs! I still believe it is her choice, but I will only be there for her now when she makes that’s choice and money will not be no problem for her rehab!!!! I just afraid that meanwhile you know????? Very inspirational from someone that has been there and done that, this does prove that the first step is the biggest and that is taken responsibility.